Managing a carious lesion without removing any carious tissue is a radical conceptual shift in the treatment of dental caries. Strategies to manage carious lesions without removing carious tissue have the advantage of reducing and often eliminating discomfort, pain, and dental anxiety that are an inadvertent part of the more invasive operative procedures. This approach is especially invaluable in treating children whose ability is compromised by age, behavior, or disabilities. The rationale behind managing carious lesions without removing carious tissue is based on current understanding that the pathogenicity of the carious lesion is dependent on how we manage the overlying plaque biofilm. Treatment modalities that disturb the biofilm or deprive the cariogenic bacteria in the biofilm of micronutrients slow down and arrest the carious lesion. 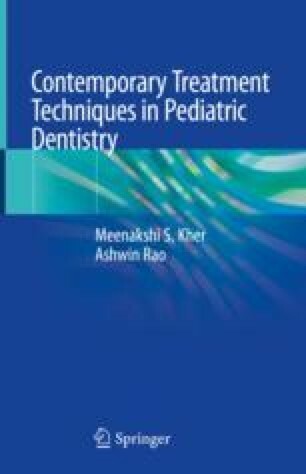 These include sealing in the carious lesion with “fissure sealing” and the “Hall technique,” arresting early proximal lesions with “resin infiltration,” and “non-restorative cavity control” with a “fluoride varnish” or the use of “silver diamine fluoride.” This chapter comprises an exhaustive discussion of each of these five procedures described step-by-step with the aid of high-quality clinical photographs, long-term follow-ups, and clinical tips. Dorri M, Dunne SM, Walsh T, Schwendicke F. Micro-invasive interventions for managing proximal dental decay in primary and permanent teeth. Cochrane Database Syst Rev. 2015;(11):CD010431. https://doi.org/10.1002/14651858.CD010431.